christytomlinson: Sharing the Love.. happy February! hello friends! it's been a while since I posted! Lots of traveling in January and creating and kids activities and just crazy! Ive also recently started a NEW obsession.. with all things planning. I Am obsessed right now with planners and getting organized but at the same time making them all cute and adorable and artsy and fun! (here's just a peak). This planner is my creative planner, Where I dump all my ideas and creative things I want to do. Currently I am using 3 different planners. All for different parts of my life and business. I created all my own inserts for each planner, using Photoshop and power-point! it's been fun! This is my everyday BIG planner, too big to take with me places, but the place where I write down EVERYTHING i need to get done that day. this is my wallet/planner for when I run to town to do errands. so little and cute! I think the reason I love it so much is that I NEED to get organized in my life, but it still allows me to be creative in SO many ways! I can use all the skills I have an as artist to customize my planner and also use it not just as a place to organize, but a place to also create! Can't wait to share more of that later.. So now I am excited to be back and just wanted to come and wish you ALL a wonderful happy LOVE week! I have a few things to announce and and share.. so lets jump right in! First off, in case you are wondering, I am making BIG plans with some awesomely talented ladies, to bring to you the most amazing online course this spring! 12 incredible ladies, all about creating girls and "she Matters" and I couldn't be MORE excited! Details will be coming soon, but I just wanted to give you the big Heads up! you are going to FLIP when you find out who's joining me! and speaking of workshops.. THIS week to celebrate the holiday ALL about love.. 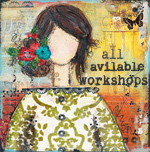 I am having a BIG LOVE flash sale on 6 of my FAVORITE online workshops! All four of the She Art Workshops series are on sale, the behind the art class AND my color creative class! Many of you have asked before, do i have to take she art one, before I can take she art 4? or 3? or 2? the answer is NO! all the classes are completely stand alone classes. They each teach different things, and I give you full step by step instructional videos for it! They are all just different styles of girls! Also for those of you looking for a total beginner class and want to learn EVERYTHING about Mixed Media.. Behind the Art is hands down my best class for this! My newest one, She Art 4, just came in out in November, so this is my most current and the first time it's on sale! wahoo! All of my online classes, you can join at anytime. It's all per-recorded video, so you have access to everything once you enter the classroom. you can watch them anytime, anywhere! To access the SALE, you must use THIS link. If you try and purchase it through my regular workshop link above, you won't get the sale discount. So make sure to click HERE! (this class is still available online, if you want to learn yourself.. simply click here! !). To Download the print, Simply download on the file under the picture, (the says view this photo) and save to your computer! 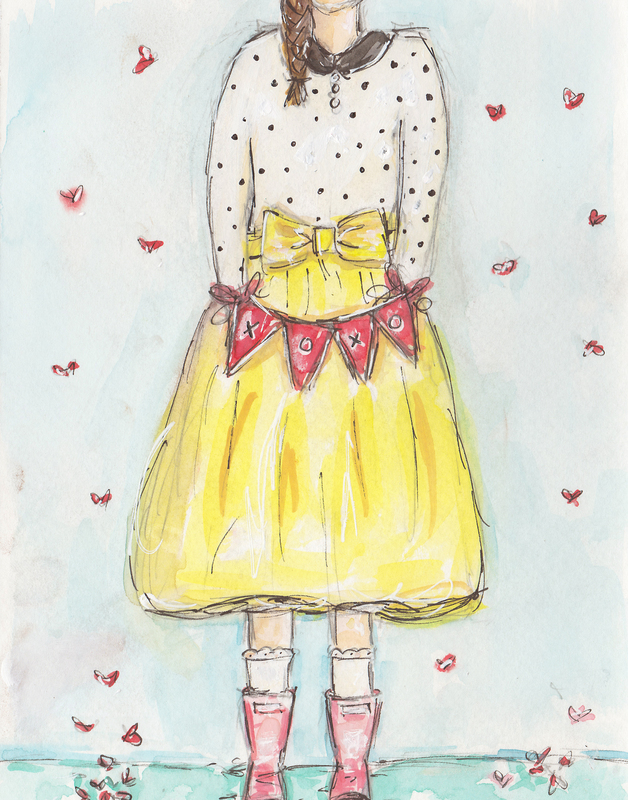 You can print it out and frame it, use it in your planner, on your art table, as a gift to a friend for valentines day! Just remember, it's for personal use only. :) thank you! So I hope you all have have a wonderful week! i can't wait to share more with you about my new planning obsession! I have a couple of videos I am working on to show you the different planners I am using, including how to set them up, and what seriously fun artsy products you can use inside your planners as well! So watch for that. I am hoping to get them done before I leave for Mexico.. in 2 weeks, so we will see! have a wonderful happy, loving week! BIG hugs to you my friends!!! okay, i'm done for...just signed up for 4 of the she art classes, received 2 boxes of treasures i ordered, and printed out the red boots girl for my grand's 16th b-day tomorrow. you can thank margie romney-aslett...i love all of her designs...honestly don't know when i am going to have time to work. happy <3s to you too!! I have so many of your projects pinned on Pinterest as inspiration for my own art journaling and mixed media canvases, but just visited your site for the first time today. Which led me to your tutorials and now it's 2 hours later! Thanks for sharing your talents with us. YEP!!! your girl is going in my planner! LOve her Christy, THANKS!!!! Thanks so much for the wonderful photo. I took the original She Art class some time ago and loved it. I will have to check out the other ones. I have been following you for a while on Instagram after having bought some of your die cuts in the past. So cute! Thank you for the sweet gift of the card print. I have a granddaughter so will enjoy using it on something special to give her! Happy Valentine's Day to you, too!